One of the most mysterious and terrifying creatures in mythology is the Werewolf. Nearly everyone would have been terrified of the werewolf in little red riding hood and would have probably had nightmares about him when they were children. 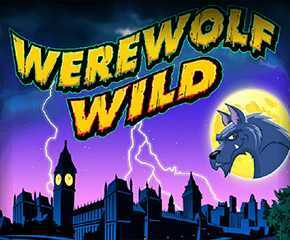 Werewolf Wild is a slot game from Aristocrat that explores the same legendary mythological creature’s story. But this game doesn’t involve the story of the little red riding hood it rather tells the story of a 19th century count or a nobleman transforming into a werewolf. Werewolf Wild has some wonderful 2D graphics that perfectly compliment the theme of the game. They give the players an eerie and dark feel while playing the game. The music to adds to the mood of the game. All the elements combined make playing this slot a wonderful experience. At least on the graphics and music part. A job well done by Aristocrat on this front one should say. The night is dark and full of terrors.. And yes of course Werewolves!! The theme of Werewolf Wild as said before is based on the mysterious werewolf and the legend surrounding it. The game’s reels are thus adorned by symbols such as a werewolf, a werewolf with a moon, a solitary moon, a nurse, a street lamp and a horse drawn carriage etc. The game also includes playing card symbols such as A, K, Q etc. 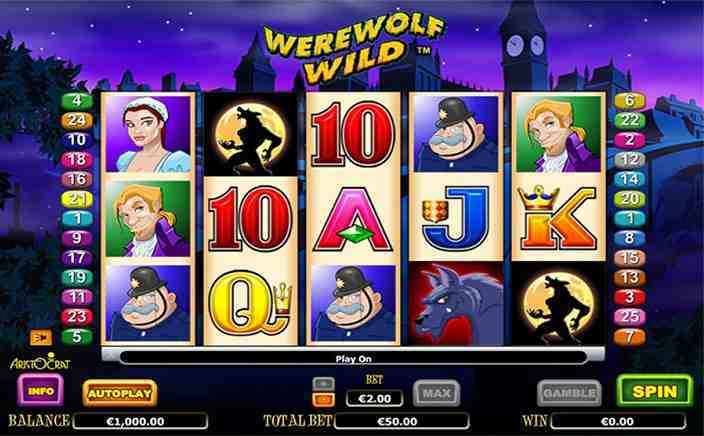 Werewolf Wild is a 5 reel and 25 payline slot game. The game has a nice range of betting options and also includes a auto spin feature. The autospin feature lets you to sit back and enjoy as the reels spin on their own! Of course you have to set your bets and the number of spins for that. The slot is a low volatile one with a house edge that is low too. The basic game is simple. You just have to choose the number of paylines you wanna bet on along with the amount of money and then just start spinning. If you land the same symbols on the adjacent reels you will win according to the amount for the symbol. What you win depends on the symbols that make up the winning combination! The werewolf symbol is the bonus symbol in Werewolf Wild and replaces all the other symbols on the reels except the scatter symbol to help you win. The full moon symbol is the scatter symbol landing at least 3 of which will guarantee you minimum of 7 free spins. These free spins are retrigerrable. Werewolf Wild is great game with a good theme and some wonderful gameplay options. This is one game that you’ll definitely enjoy playing. So, go on and start spinning.